9 x Pvts/Cannoneers + .30 cal M1 Carbines. Pvt/Gun Mechanic + .30 cal M1 Carbine. 9 x Pvts/Ammunition Bearers + .30 cal M1 Carbines. 2 x Pvt/Driver (Towing Vehicle) + .30 cal M1 Rifles w/M7 Grenade Launchers. Round Weight HE (M106) 90.12 kg. Bagged Charge (M1) 6.3 kg & 13.56 kg (M2). Notes Designed as a long ranged support weapon to partner its close relative the M1 155mm gun the M1 8in howitzer was also shelved only to be revived later. It was standardized in 1940 but priority went to the M2A1 gun. The first howitzers were produced in 1942 and were kept in production until 1945. The M1 was very accurate and first saw action in Italy in 1943. It was issued at Corps level to US army and the Marine Corps. 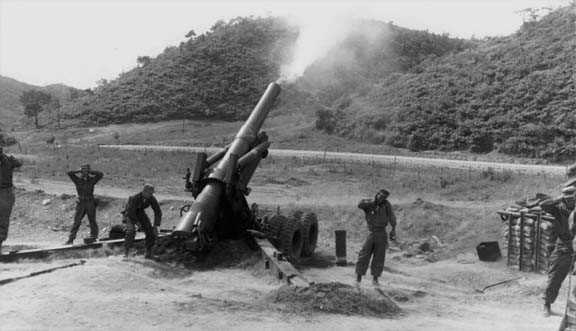 After WW2 It was redesignated as the M115 howitzer and continued in service through the Korea war and Vietnam.